The longer you stay quit the more benefits you will experience! Keep up the great work into February, March and the rest of the year! Quitting smoking is one of the best things you can do to reduce your cancer risk. Smoking causes 16 different cancers and is also linked to cardiovascular and respiratory diseases including heart disease, stroke and emphysema. Around 15,500 cases of cancer diagnosed each year in Australian adults could be linked to tobacco smoking. 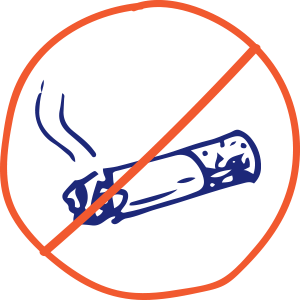 There is no safe level of tobacco smoking, so it’s important you quit smoking all together, rather than just cut down. There are many health benefits from quitting smoking. In the first 6 hours of quitting, your heart rate slows and blow pressure becomes more stable. Within a week your sense of smell and taste start to improve. Within 5 years there is a large drop in your risk of heart attack and stroke and after 15 years of no smoking your risk of heart attack and stroke is close to that of a person who has never smoked. Along with the health benefits, quitting smoking has financial benefits – a pack a day smoker could save up to $9,500 over the course of a year! Quitting smoking also leads to improved mental health and wellbeing. If you quit, you also reduce the harms to other people around you by not exposing them to second-hand smoke.